Gluten-Free dentistry? Yes, that’s actually a thing. Yes! We are becoming increasingly aware of the impact gluten has on our health and wellness. A growing number of people are finding that removing gluten from their diets leads to more energy, better digestion, weight loss, and an overall sense of vigor; while for others with Celiac disease it is downright dangerous to consume even small amounts of the stuff. That got me thinking about the relationship between gluten and dental work. Your visit to the dentist generally involves us putting various stuff in your mouth, most of which you spit out, some of which you inadvertently consume. But what dental items could possibly have gluten? Many of the polishing pastes, fluoride gels, and topical anesthetics used in a dental office have artificial flavorings that unfortunately contain gluten. Ok, sure, but how much gluten are we really consuming in those products? Honestly, I don’t know. But that isn’t the point. You, the patient, have the right to be concerned about putting any gluten in your body, and thankfully you have the choice not to. Boulder Dental Arts has been able to purchase only 100% gluten-free toothpastes, mouth washes, pastes, gels, and topicals (through DMG in case you are curious). 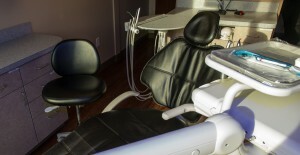 You have enough to worry about during a dental appointment, this shouldn’t be one of them. Read the Daily Camera Article. In need of a gluten free dentist in Boulder?